The Retros - Probably the best party band in the world! The Retros started officially in 1985 but have roots going back to Precious Little in 1975 and The Banned in 1977. Paul Aitken, the drummer/vocalist in these bands, decided to take charge of his own destiny and start a new band from scratch. He wrote down a list of favourite songs, got copies of the tracks, wrote out words and chord sheets and set about finding some local musicians to form the band originally known as Retrospecs. 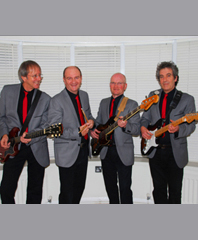 In 1986, as interest in the band grew, the name changed and so did the line up with Ben Grove (rhythm guitar) and Graeme Taylor (lead guitar) from the days of Precious Little plus Steve Morley (bass guitar) joining the band known as The Retros. Paul Aitken (drums), Ben Grove (rhythm guitar), Gordon Sellar (lead guitar) and Steve Morley (bass guitar).